Take the Blue Beetle for example. Without his equipment where would he be today? Beetle, known as Ted Kord, is a mild mannered scientist. A man who has plenty of time, smarts, and gadgets. However, he does not possess any superpowers at all. He does have some knowledge of the martial arts though. There is no doubt that he is a brilliant craftsman, evident in his beetle inspired airship known as the “Bug”. Besides that impressive mechanical vehicle, he definitely lacks the 'intimidation factor' most heroes have. 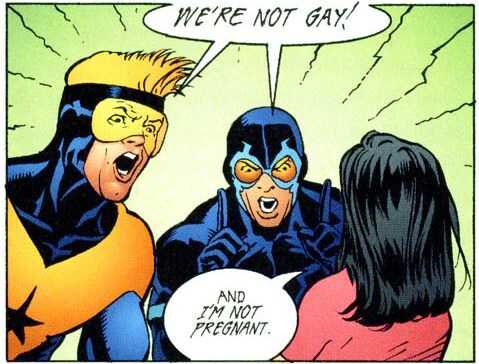 Booster Gold has other flaws I can mention too. Always making comments about how cool and handsome he looks. The truth is, he tends to exaggerate the facts about himself. He stole artifacts from a museum and created a power suit from it that projects 'force blasts'. Michael Jon Carter is his real name, and he was a former football player turned superhero by chance. 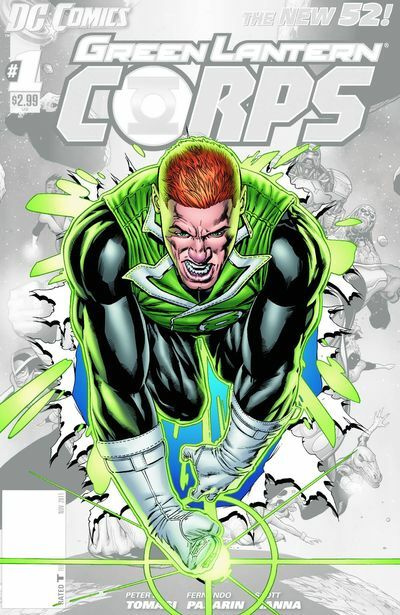 On the other hand, Guy Gardner started out as being a respectable hero. He graduated with a bachelors degree in education and psychology. Gardner’s father was an alcoholic who beat him up regularly, and his situation has a bit of realism to it. He apparently was always second-best compared to Hal Jordan, who was one of the most popular Green Lanterns in the Corps. Apparently, after he received brain damage, he then became an aggressive arrogant hero, who always insists on brash quotes. The fact that these three heroes have these types of problems is what actually leads to their appeal in my opinion. In many ways they are ordinary people brought into exclusive clubs, making them somewhat relatable. Given half a chance, they can prove inner greatness which may not be easily noticeable. Booster and Beetle have made several notable appearances together in numerous comic books. Beetle has appeared in several issues of 'Booster Gold'. Booster, for some reason, seems to be always having a good time. Booster tries to bring out the fun in Beetle, which in itself is a right challenge. During many of their exploits, many refer to these two as 'Blue and Gold'. To further cement their friendship, they worked in a fast food restaurant from hell in the issue JLA Classified #6, which was the third installment of the six-part miniseries, 'I Can't Believe It's Not the Justice League'. In an odd twist, Guy Gardner comes up with a plan to help rescue them from that fry cook hell. Guy Gardner was not as close to either Beetle or Booster. Gardner seems like the odd man out. Sometimes the two tried to include Gardner in on whatever adventure they were involved in. That dynamic always causes good friction. There has been lots of internal fighting, much of it started by Gardner. One struggle began when Gardner sucker punched Blue Beetle, resulting in Booster and Gardner having a big brawl. In another series, Booster convinced Gardner to visit his dying father. He wanted to ensure that Jordan would be first in line. This type of shenanigans has always caused an external turmoil between the characters. Yet Gardner does help create an interesting dynamic. He doesn't fit in perfectly. Agreed. He adds a blend of chaos to the mix. Gardner is the wild card who can either make a bad situation somewhat better or even worse. Sometimes, the calculation is worth it. 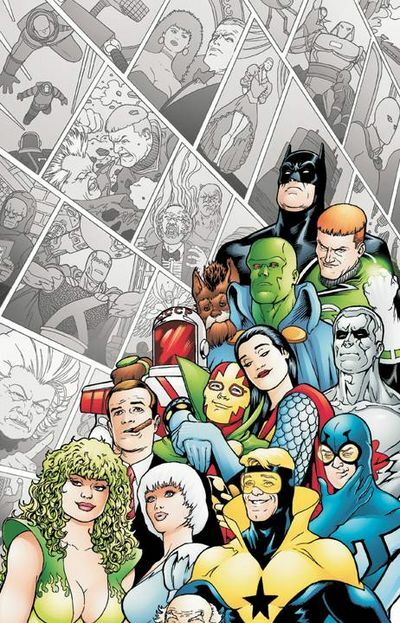 All three appear in Justice League International #24, “Who Let these guys in”, Gardner declares on the cover. 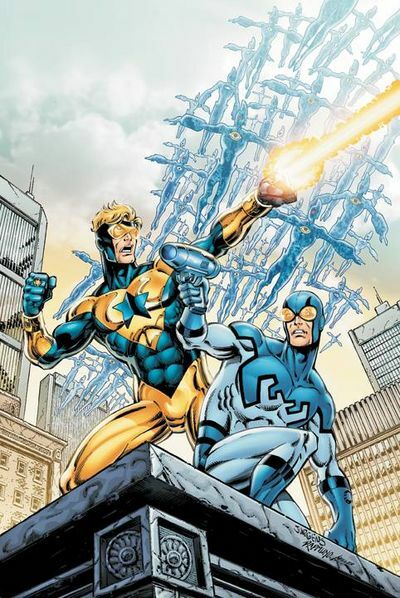 In this series Booster recruited Blue Beetle for what some call the “Superbuddies”, formed partly from the Justice League. The name ‘Superbuddies’ says it all. It maybe the least intimidating name in superhero history. On a side note, the Blue Beetle -- at least the Ted Kord version -- is apparently dead, but as we all well know, a comic book resurrection of characters is almost certain with endless alternate universe and 'what if' scenarios. There are two newer versions of Blue Beetle, one a female Jaime Reyes and the Scarab. The Beetle seems to be moving in a new direction. However, we know that most of these characters we grew up with in the eighties are bound to show up again and again with new dynamics between the three. In many ways these flawed heroes are some of my favorites, and that is why they have fascinated me. They should sometimes not say all the right things, and have attitude problems. Superheroes should have flaws and be as human as the rest of us. Blue Beetle, Guy Gardner and Booster Gold, all prove that the most unlikely heroes sometimes come up with the most unlikely plan that sometimes actually does save the planet -- or maybe just the day -- or just gets them out of a mess they created for themselves. This post was written by Bob Eager, who has been published in Static Movement, Exiles literary, Modern Rock Review, Rogue Cinema and Copperfield Review.